A look back through the news in recent years reveals that there are currently two new races that have signed contracts: the New Jersey event in 2013 and a Russian GP in 2014. There are 20 races on the F1 calendar, although it remains to be seen whether the teams agree to go to Bahrain. The teams are also only willing to do that many events, not because of the money but rather because their crews are already stretched too far and if there is a 21st race they would need to move into the realms of twin crews, which would cost a lot more money. So the squeeze is on because 21 into 20 does not go. And 22 into 20 quite clearly does not go. And we should also mention that both Mexico and Cape Town are still making noises about getting F1 deals. Belgium must sort out a new contract soon. It cannot afford it but is planning to save Spa as an F1 track by doing an alternation deal with France, similar to the arrangements that the two German race tracks have at the moment. The Japanese GP contract is up for grabs this year, while Bahrain needs a new deal after 2013. Canada and Singapore need new deals after their events in 2014 and in 2015 we have Australia, Malaysia and Brazil needing new deals. Spain needs to watch out too because although Barcelona has a contract until after the 2016 race and Valencia until after 2014, it is very clear that no-one has told the Spanish yet that they are going to get only race between them and they can fight over whether they pay more or share the Spanish GP. There is still a bit of a log-jam in 2013, unless the problems in Bahrain continue. The locals know that there is a threat to the race in the long-term and perhaps this is why they are so keen to get the event back on the rails this year. Can F1 live without Japan? Right now, that would not be hard. There are plenty of races in Asia and no Japanese manufacturers involved. The only driver is Kamui Kobayashi. At the same time, Japan is at least a developed F1 market, rather than some of the other countries where F1 is still so new that no-one gets it. Perhaps, you might say, Russia and New Jersey will not make it. I doubt that. Yes, the United States is a litigious place, but it seems that the idea of a race has excited the folks of New Jersey, if only because they realise that a successful event will double the value of their houses. And Russia? 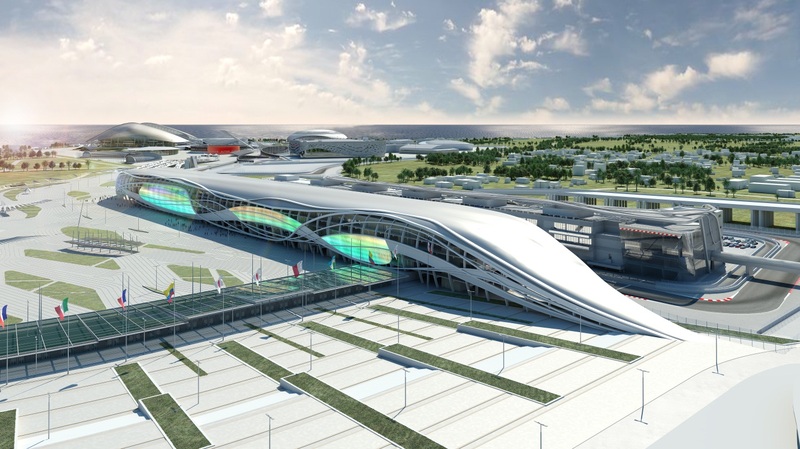 Well, a lot is being done at Sochi at the moment to finish the site of the Winter Olympic Games, which are scheduled to take place in February 2014. 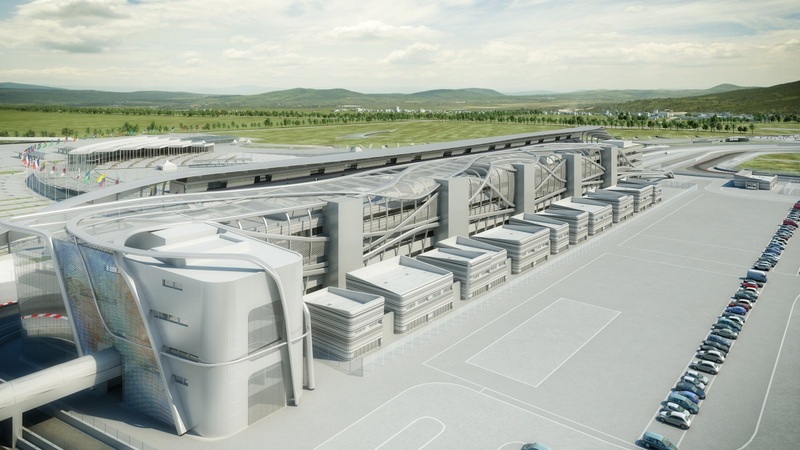 Some of the projects are running behind schedule, but the important ones are on track. Russia is using the Olympics to develop the entire region and having a deadline to meet is a good way of making things happen. The plans for the racing circuit are already financed and include such things as a kart track to help develop young Russian drivers. 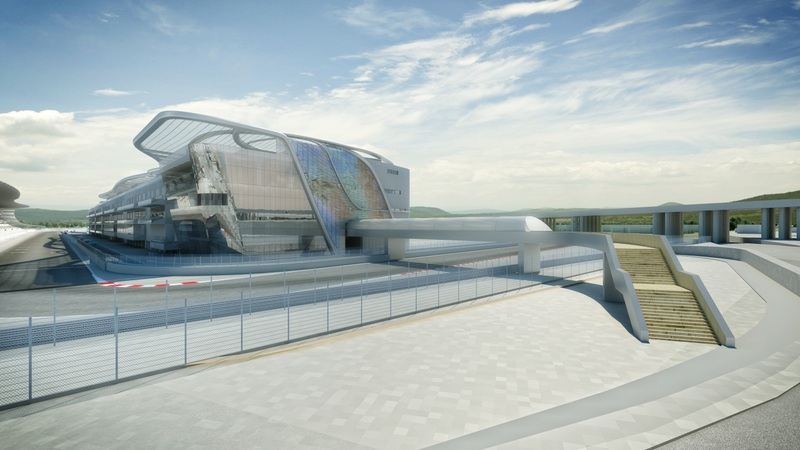 The region has $190 million to spend and some of the building work will be done before the Games, although the actual tarmac of the race track will not go down until afterwards. Some of the facilities are going to be temporary – in the Albert Park tradition – but other parts will be permanent. Here are a few photographs of the buildings that are in the planning stages. The planned main grandstand will be permanent. As a fan, I would like to see Valencia and Barcelona being taken off the calender. Not because I have something against Spain, but because both tracks haven’t brought us many exciting races. It is not going to happen, but I would love to see them being replaced by Portimao in Portugal. I agree that it would be a shame, to say the least, to lose Spa – Joe’s pics of another featureless (I assume) track fills me with despair, no matter how modern the facilities are. Doesn’t always make for good racing does it? Again, depends on which side of the (catchment) fence you are……. The Spaniards will renegotiate this year to sort out an alternating venue system and it’ll run longer, to 2018 or something. If nothing else, The Bernard might “pay off someone putting pressure on him” in order to get a required sports budget cut slipped into clauses of an EU bailout package should the Spanish economy fall any further. The 2013 slot *might* be provided by Bahrain – if they can’t run the 2012 race then I suspect there will be a quiet deal to cancel 2013 as well and call it quits. In any case, I’m not sure I see its contract being renewed. The Bernard likes Bahrain because it pays its fees on time and in piles of gold (not literally) but I don’t see the attraction for the car companies and sponsors – it’s a tiny country (smaller population than the urban area of Valencia) full of foreigners. Losing Japan, especially Suzuka would be a great shame. Scene of many great races and home of (probably) the most dedicated F1 fan base outside Europe. And cutting the Japanese GP is a dangerous game because long term F1 will want the likes of Honda and Toyota to at least consider restarting their F1 engines divisions. Surely those are architect’s/artist’s impressions, rather than actual photographs if the buildings are still in the planning stages? There is something deeply wrong with the sport if they race in Bahrain and stop racing at Suzuka. I think Suzuka is a great track. Even Vettel messed up Degner this year. Shame to lose this track, I wanna see it while its still running! But what’s new with Korea? The news about them wanting to renegotiate a lower fee, since they cant afford it, anything new with that? I thought that would be one to go, considering how Bernie wouldnt want less money when all these tracks are offering him the world. anyways, always enjoy your posts, Joe! I am quite interested to see how the track in Austin will turn out though, and whether the track in India will yield a better race this year. That track actually looks great, even if the race was not exactly the most exciting of this year. Joe, do you think Singapore stands a good chance of getting extended after 2014? Having it in the city centre where it is now causes too much traffic disruption around the period of the F1 race. 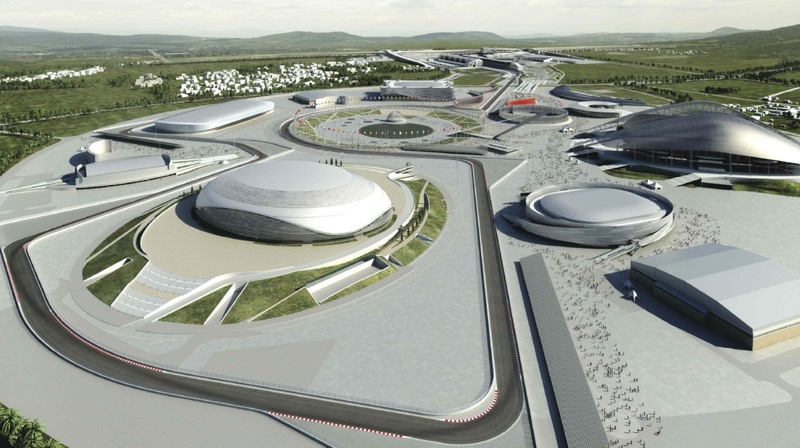 Is it just me or does the Sochi circuit look great architecturally, but just seem like another borefest in waiting?? Stop removing the “proper” race tracks – Spa and Suzuka are right up there in my top 5! Never been a fan of these new style street races. Blasphemy I know, but I’ve never really found Monaco all that either! Some pretty buildings and huge expanses of concrete. Abu Dhabi should be worried. This is clearly a potentially tumultuous several years for the Formula 1 calendar coming up. I, too, would hate to see Spa on an alternating basis, but it beats losing the GP altogether. Despite the other Asian venues, losing Suzuka would be big. Drivers love it and, personally, it is a fantastic circuit to watch regardless of passing (or a lack thereof). The folks in Melbourne have shown a lot of angst in recent years with the high price of hosting an F1 race, so I would think Melbourne is a high-risk renewal. If Melbourne is lost, I wonder if Adelaide would be reconsidered…or how about the rumors of a purpose-built track near Melbourne? Hard to imagine the Aussies without a grand prix. Straight out question, do the teams not care about saving historical venues like Spa and Suzuka? F1 would be a much poorer place without these tracks. I see a few long term moves being made of late that I can see turning the mainstream audience away from the sport in the next few years, most obviously the cost of actually following the sport. Yes, they care. But it is not their call. In 2005 the “New York City region” had almost 19 million citizens. It’s hard to imagine they can ‘t make New Jersey profitable. I really do hope that NJ happens, for me it makes all the sense in the world. If F1 wants to make inroads into the US marked there needs to be a more substantial part of the F1 calendar in a timezone that works for this side of the planet. No F1 newbie is going to wake up at 8:00am every other saturday and sunday to watch a race, they need to be hooked first and that will only happen when they have a critical mass of races at prime time. As for the classic circuits, I really hope places like Spa and Suzuka get their acts together, but it does seem that for Bernie, only Monaco is sacred, all the other venues must pay up or go the way of the Dodo, quality of the spectacle be damed, CVC and Mr. E’s babies need a new pair of shoes…or mansion in L.A. Personally I think that Japan will stay. Asia is where the money/growth is these days and Bernie will know that. Whilst Japan is not the economic star it once was, the country is still a powerhouse. There are plenty of potential/current sponsors and the grandstands are always full. As for Australia, whilst there is a lot of grumbling around renewal time, I think the GP will stay in the country. Melbourne is about to spend several hundred million on upgrading the tennis centre in order to keep the Australian Open. Melbourne has positioned itself as the event capital of Australia. With inbound tourism to Australia in recent years suffering, I think there will be pressure on the Federal and/or state government to maintain funding for the event. If not, there are other states hungry for the attention. Sydney, Adelaide or even Perth (which is overflowing with mining money and would crave the prestige an F1 race would bring) could be possible alternatives if Melbourne drops the ball. Sydney already spends ~$10m p.a. on supporting a touring car race in the city. So this money could easily be transferred to support an F1 race instead. I’m kind of disappointed that the Sochi circuit has been revised. The original plan had a much smoother turn coming the long left-hander, so it looked like it was going to be really fast – a long left-hander that felt like it was going to go on forever, followed by a fantastically-quick right-hander that crept up on you if you weren’t careful. I really thought it had the makings of a classic corner, but it’s been tightened up. I had no idea you were a Russian.